2015 Road Trip Photos #37: Biloxi Views « Midlife Crisis Crossover! Today the coastline along the Mississippi Sound is a calmer, beauteous place. As a target to multiple hurricanes over the past two centuries, it hasn’t always been like that. We found a few places on our drive through Biloxi that testify to the tragedy in those moments as well as to the resilience of its residents and their works. 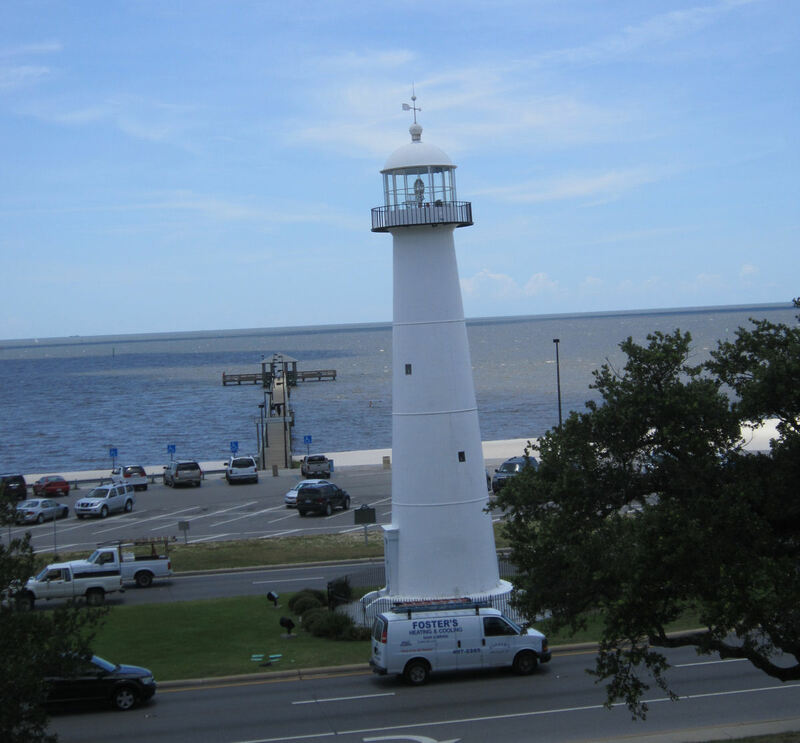 The Biloxi Lighthouse was built in 1848 and served its intended functions for many decades until it was turned over to the City of Biloxi and remade into a sightseeing attraction. 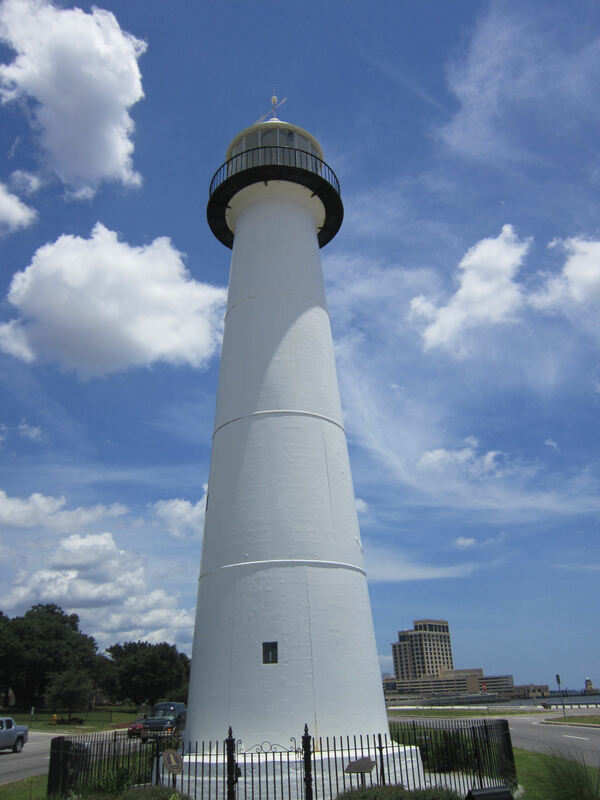 When Hurricane Katrina struck on August 28, 2005, it damaged the windows, lighting, and interior walls, but the cast-iron shell was among the few familiar sights still standing when the waters receded. It wasn’t reopened until 2010, after extensive repairs. A year later, the new Biloxi Visitors Center was opened across the street as a storytelling locus for the city. 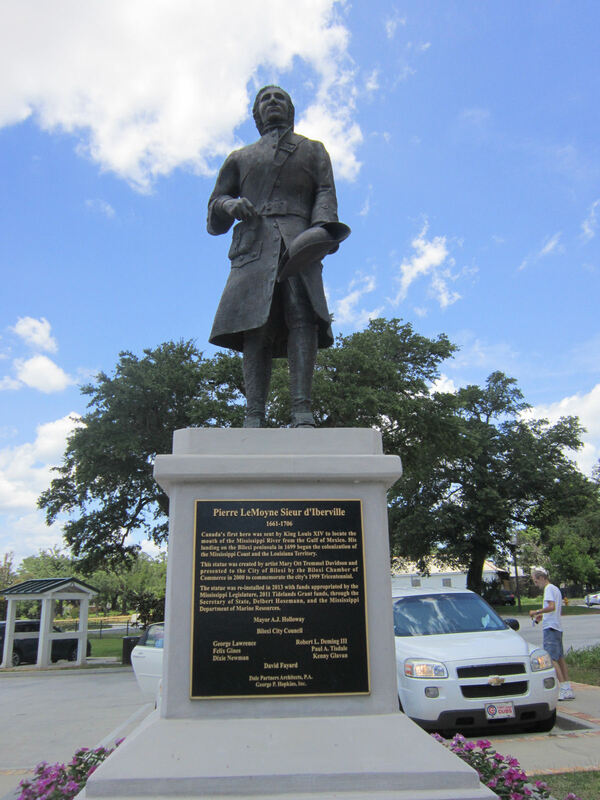 Standing guard near the entrance is Pierre LeMoyne Sieur d’Iberville, the French explorer who traveled from Canada down the Mississippi and helped establish civilization around the Mississippi Coast circa 1700. 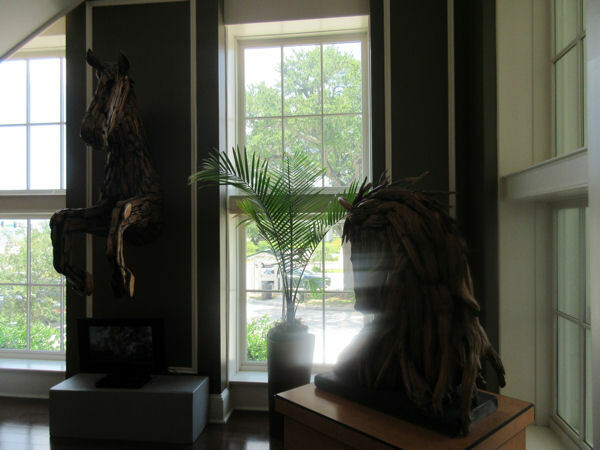 Inside the Visitors Center, a variety of art and artifacts commemorate the skills and visions of residents past and present. 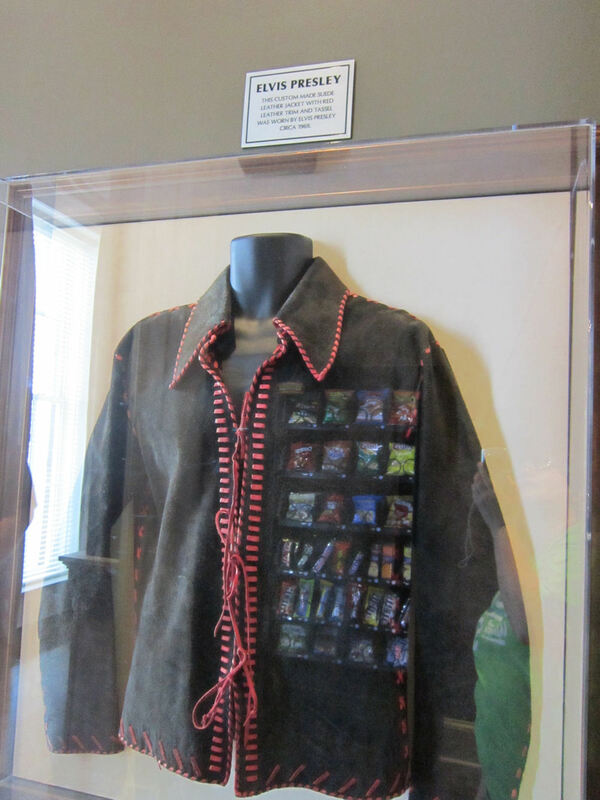 A few celebrity keepsakes on hand include a 1969 jacket that once belonged to Mississippi native Elvis Presley. Sad trivia: in double-checking his story, I just now realized he was a year younger when he died in 1977 than I am today. 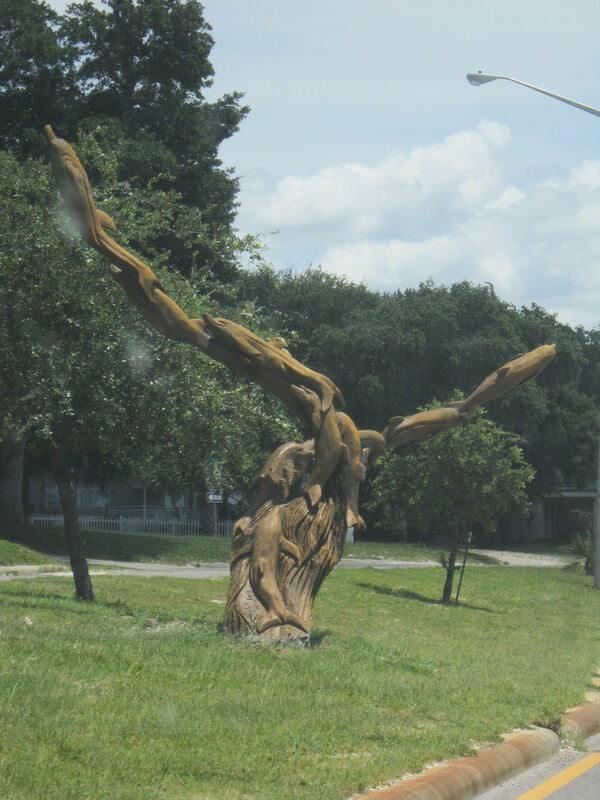 Also along US 90 are a series of chainsaw sculptures commissioned after Katrina from three different artists, including one from our home state of Indiana. 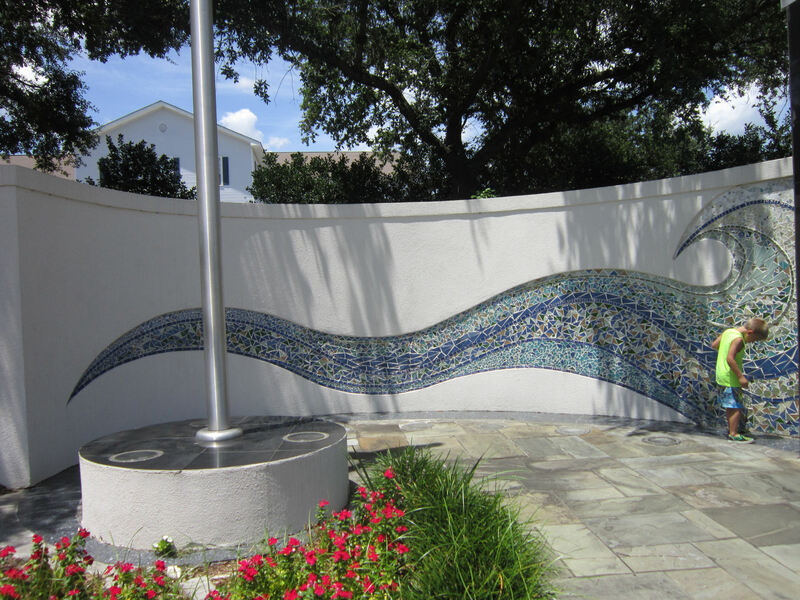 The hope-filled soaring-dolphin relief below is by Florida sculptor Marlin Miller. 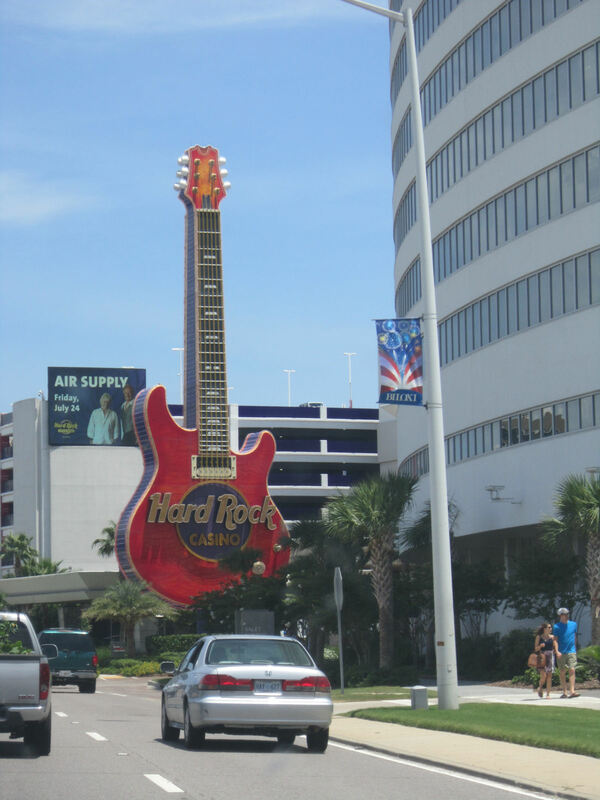 Biloxi is a large enough resort area to merit its own Hard Rock Cafe. It was originally scheduled to open September 1, 2005, but in a masterstroke of cosmically atrocious timing, Katrina showed up three days before their big debut and dashed all their plans for a while. Incredibly, according to at least one photo I found, their giant guitar was already completed and managed to withstand the pressures of Katrina, though much of the surroundings didn’t persevere quite so well. The Cafe opened two years late and welcomed as its first musical guest the one and only Kid Rock. Meanwhile across the street, there now stands a Hurricane Katrina memorial park dedicated in February 2006 thanks to the construction crew at Extreme Makeover: Home Edition. The wall lists the name of some 170 Gulf Coast casualties, while the granite capstone marks the height of the flooding at its worst, not including waves. 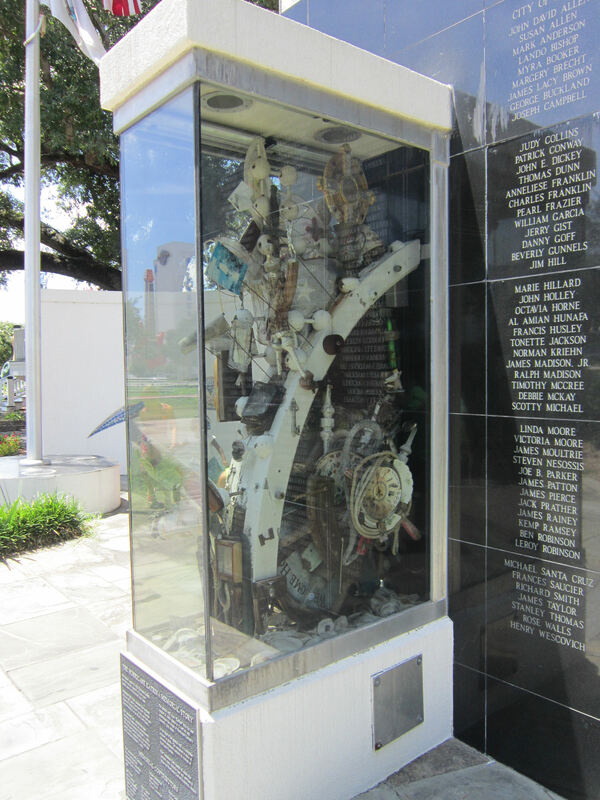 In the display case is an assortment of Katrina debris donated by the citizens of Biloxi. To the left of the wall is a stylized Katrina mosaic, a few feet shorter than the capstone but well above this tiny child’s head. 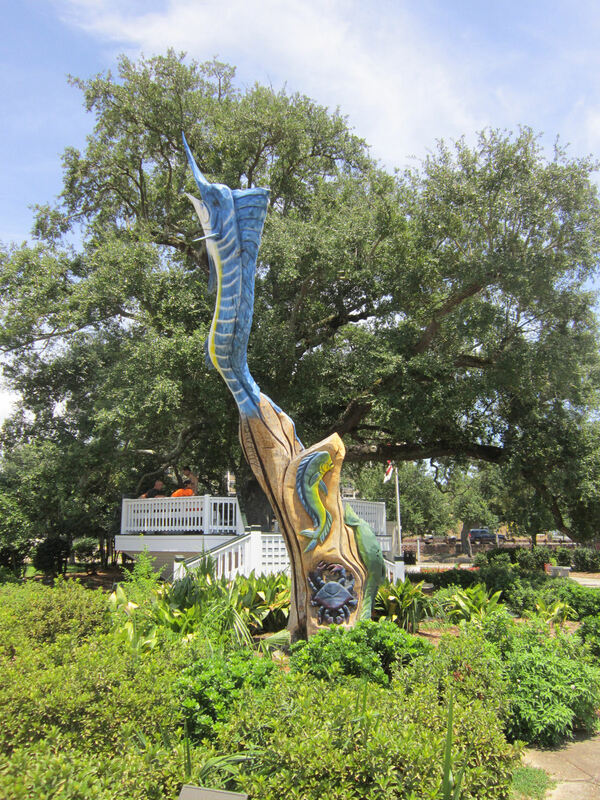 Standing in the same park is another Marlin Miller chainsaw sculpture, continuing the motif of local life rising above. Just past the Hard Rock Cafe, the Biloxi Bay Bridge carries you across the sound and away from the city. The bridge was basically left demolished in the wake of Katrina and took three years to rebuild in full. 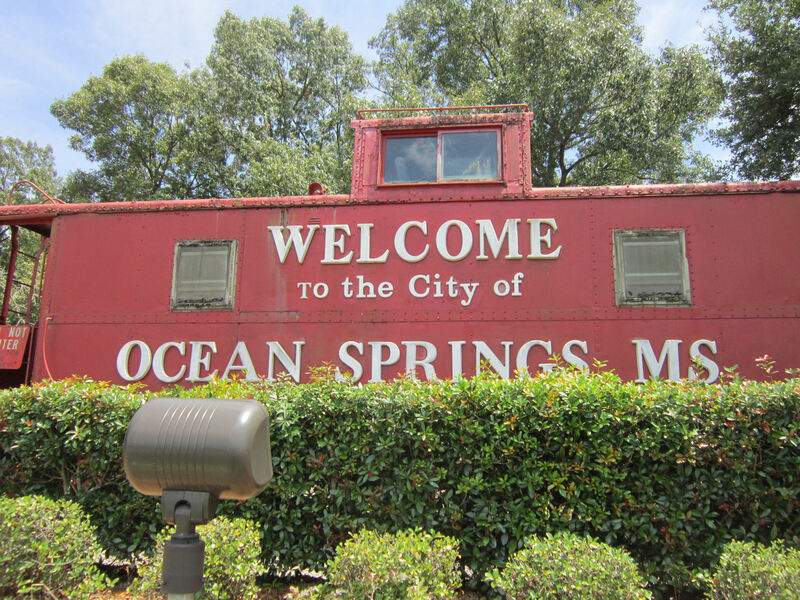 On the other side is the smaller town of Ocean Springs, MS, which is more into art galleries than beaches. Their welcome caboose used to be a fixture near their City Hall in honor of their railroading past, but it took up too many parking spaces and was relegated to the new job of Town Greeter. 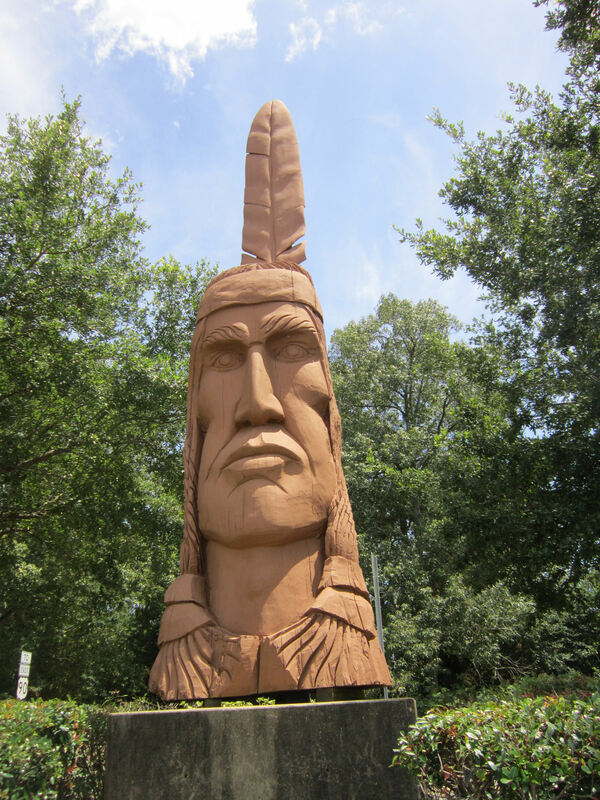 Next to the caboose is the sculpture called Crooked Feather, carved in 1999 from a cypress log eleven feet long and five feet wide. He, like the other monuments above, stood tall in the face of Katrina and didn’t blink. Beyond Ocean Springs, we had one more waterside stop on our Day Five itinerary before we had to turn north toward home. 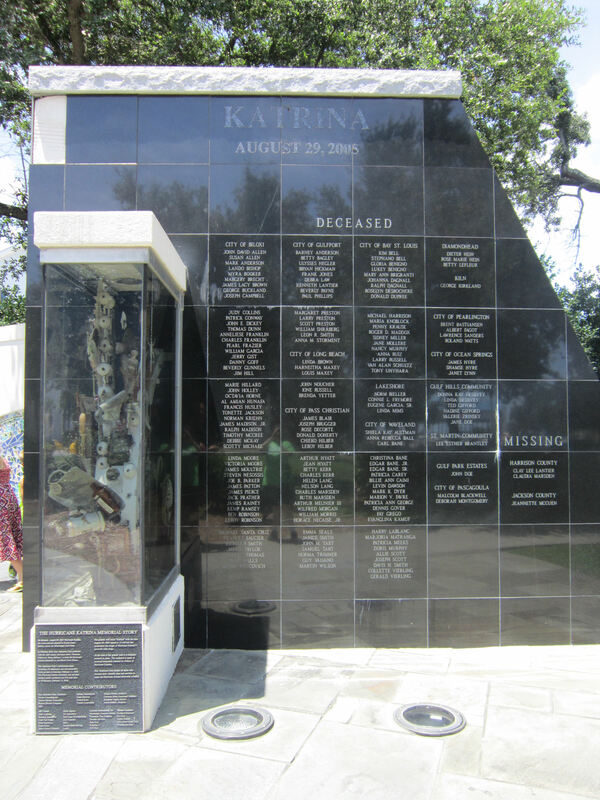 These, as I recall, were the last major markers of the effects of Hurricane Katrina that we saw in Mississippi during our Southern U.S. road trip, solemn reminders that New Orleans wasn’t the only city that suffered and survived the juggernaut’s path.